The Indian state of Kerala is known for its high social model of development and social democratic governance. This book presents the most comprehensive analysis of the Kerala Model of Social Development to date. The model has often been identified as one worth emulating because it is seen to have taken the state to the zenith of human development and democratic governance. Using an interdisciplinary approach, the book sheds new light on the paradoxes of the Indian state and its model of economic development. 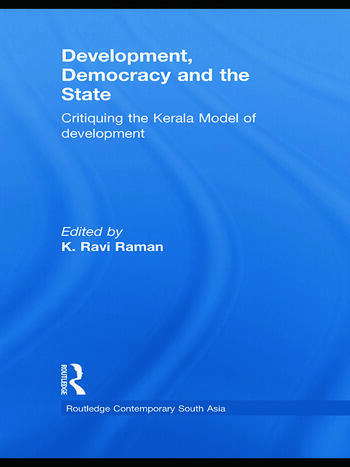 The book provides a consolidated exploration and critique of the Kerala model, which usually has been portrayed as linear with the grand narrative of progress, development and democracy. Chapters discuss the past and present dimensions of the Kerala experience from a historical and political-economic perspective, thus providing a fresh understanding of the emerging concerns in the state and the construction of an ethically viable development agenda, eschewing the scourge of social inequity. A significant contribution to the literature on development, democracy and the state, it analyses the complex interconnectedness of the various political-economic and socio-cultural domains involved in these experiences. K. Ravi Raman was a Hallsworth Research Fellow (2005–8) in the Department of Social Anthropology, University of Manchester and is currently a Research Associate in the Department of Development Studies, SOAS, London. He is the author of Global Capital and Peripheral Labour (2010) and co-editor of Corporate Social Responsibility, forthcoming.